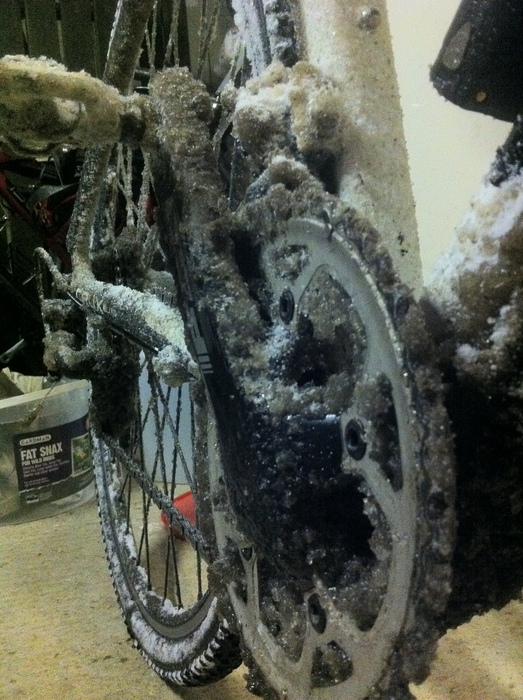 Snow is no excuse to stop cycling, that's the bottom line. You might have the wrong tyres or clothing, but with a little bit of preparation you can ride as usual. 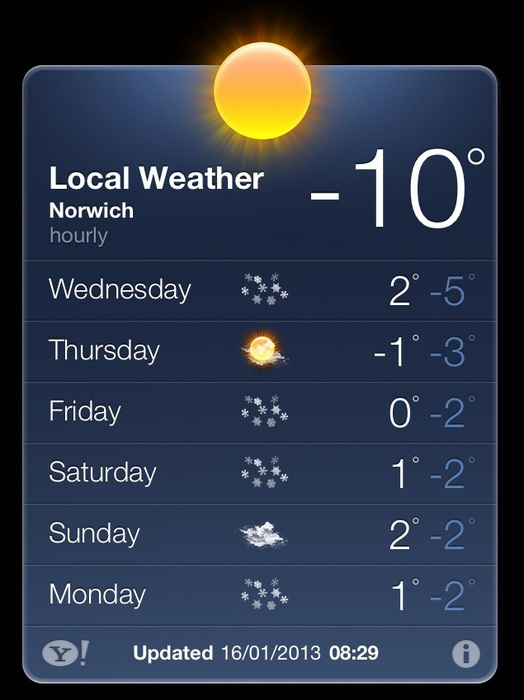 The only wintry conditions to stop you are extreme cold (-3 degrees C and below), blizzards and lots of sheet ice. Don't ride if it's too cold. Even with full winter gloves you will be in danger of injuring your fingers and toes as the wind-blasting encourages your body to deprive them of blood flow. You may also expose yourself to a chest infection, as you're inhaling large volumes of icy air. Don't ride if you can't see where you're going. Even if you think that you can see well enough, there will probably be other people out driving, maybe too fast and incapable of seeing you and stopping in time. 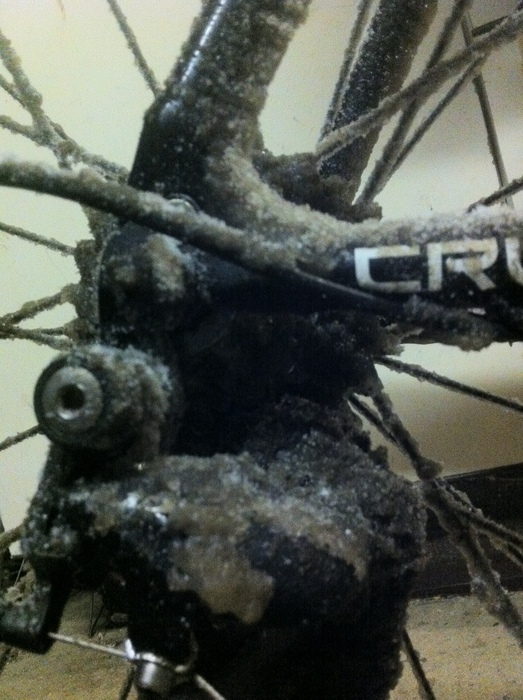 Don't ride when there's widespread sheet ice. The odd patch can be negotiated carefully, but you will almost certainly come a cropper if there's lots of it about. You have almost no steering, acceleration or braking capability on sheet ice, unless you have specialist studded ice tyres. You only need to make a couple of adjustments to your ride. Knobbly tyres are essential (studded tyres if you're being serious about it) and low pressures will help with cornering and general grip. 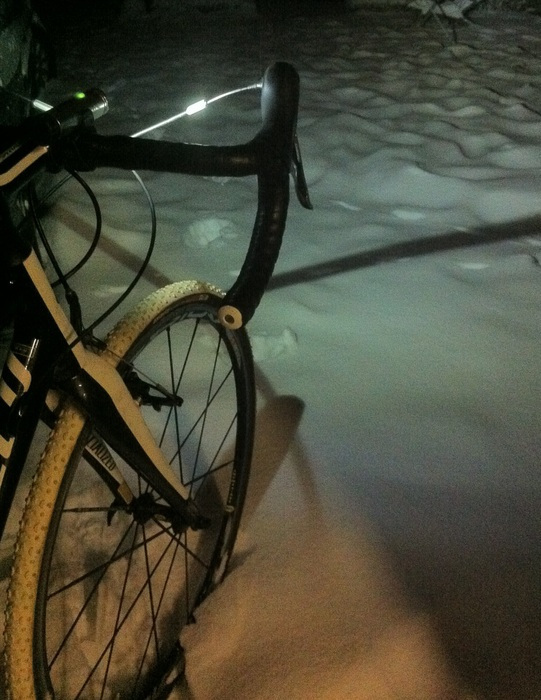 I ride a cyclocross bike in the snow, on 33mm tyres inflated to around 25-30 psi. Lubrication and cleaning are very important for your bike. 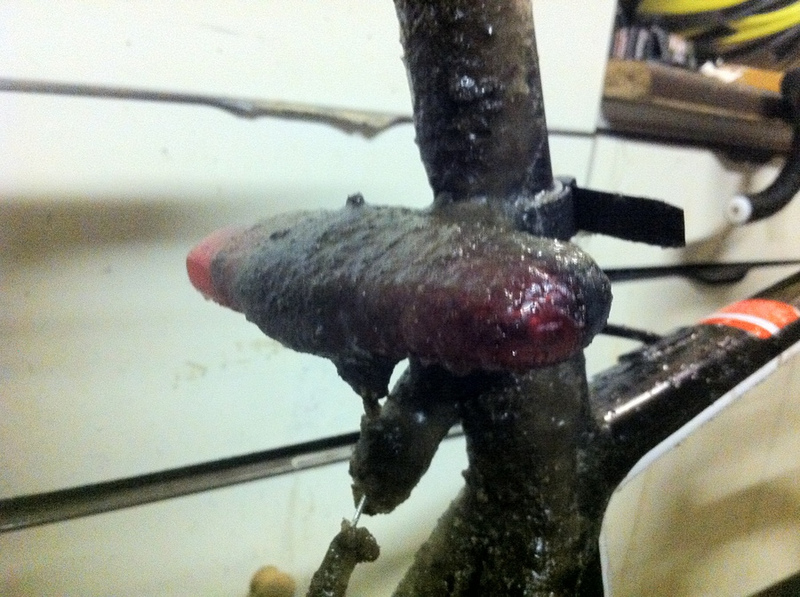 Make sure it's well oiled before you ride, and wash your bike down with warm water at the end of your ride. The wash-down will remove highly-corrosive salt that may have been put on the roads, and will also free up components where snow and ice have accumulated. Post-ride lubrication - especially on the drive-train - is essential too. Dress yourself well. It's all about layers: Lots of thin ones. (Gloves are the exception to this: a single tight-fitting pair of thermal gloves should do the trick.) I find that lycra performs very well in the cold, and a pair of shorts, tights, jersey and lightweight high-vis jacket usually do the trick. If the air temperature is below freezing, I add a t-shirt as a base layer and a bandana under the helmet (to cover the ears). For the feet I wear thermal socks, regular cycling shoes and a pair of over-shoes. 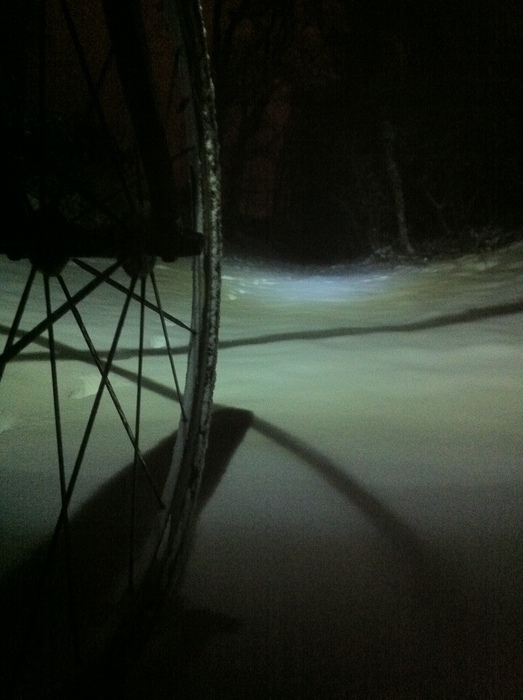 You need to establish your own level of confidence when snow-riding. Fresh snow isn't very slippery, but can be especially hard to negotiate when there's been fresh snow-fall on a rutted and icy road surface. In general, I find that cycling too slowly (under 10mph or so) can be much harder than a higher speed, as I am having to do much more correction to my steering. What often happens is that there are lots of small bits of unevenness to negotiate, and these can be easier to 'blast through' rather than tip-toeing through them. 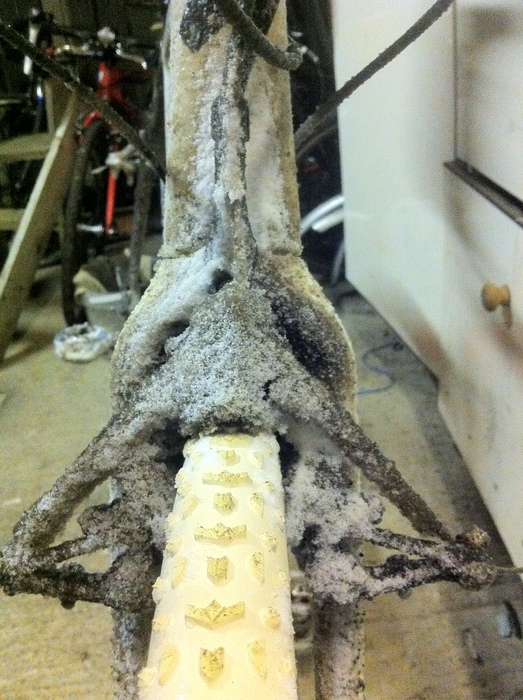 As I've said, how hard you ride is a confidence thing, and is something you need to establish as you ride.